Free public access to all coastal areas and sea cliffs in Wales has come a big step closer following a shake-up of access law recently announced by the Welsh Government. Anticipation is building as the world of mountain running turns its eyes to Wales and the return of the legendary Berghaus Dragon's Back Race® in May. The 2019 race will be the biggest ever, with 450 anticipated starters from 32 different nations. Mud, mountains and the mind - a new survey reveals 99% of women in adventure find that the outdoors has a positive impact on mental wellbeing. Want to learn or advance your outdoor and mountain skills or try something completely new? Cicerone is 50 in 2019 and, as part of our celebrations, we have a very special competition for you. The Climbing Gear Revolution: Saturday 9th March. To celebrate the launch of its innovative, new Ferrata II GTX boot, footwear-expert Hanwag has teamed up with UKC and UKH to offer one reader the chance to win a pair for themselves! Open Comp Win a Luci Solar String Light! Height Safety Instructor required One full time position delivering height safety and rescue training, based at our Leeds Height Safety Centre. We're looking to welcome a Climbing instructor to the Ice Factor Team on a full-time basis. 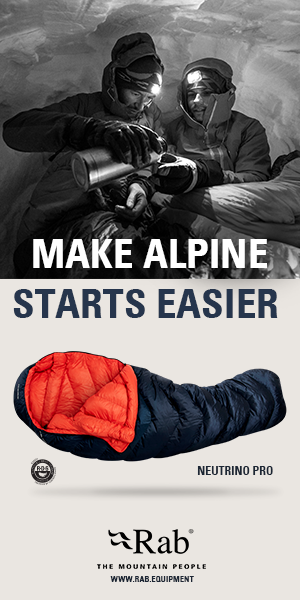 Alpkit UK Factory Machinist and Factory Manager positions, Nottingham.